Building a square foot garden - is it right for you? We'll help you decide. What is involved in building a square foot garden? Before I answer this, I encourage you not to try to grow a square foot garden without buying the All New Square Foot Gardening book. It is totally loaded with well organized information that you won’t find anywhere else. Besides the book and a good trace mineral fertilizer source, which is not furnished by Mel's mix, you need basically just two things to get started. Be prepared for some initial expense, but you need both of the following if you are going to enjoy the benefits that come from building a square foot garden. When building a square foot garden, you want a box that sits on top of the ground, so that excess water can run out the bottom. What do you build it out of? Some good choices are non-treated wood, plastic, and vinyl. Make sure to put a few 1/4” holes in the bottom for drainage. You want your garden to be small enough that you can comfortably reach half way across from each side to do your gardening. You never want to step foot inside your garden, as this compacts the soil. For most plants, a 6” deep box is all that is needed. You can also make your box 8 inches, 10 inches, or even 12 inches deep. You will definitely need more than 6” of depth for carrots, potatoes and leeks. Remember, a deeper box looks nice, but is considerably more expensive to fill with Mel’s Mix. 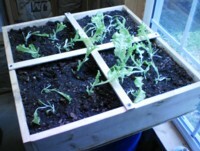 As you see in the picture, make sure and add dividers to help you to plant each square foot separately. You can build your square foot garden from inexpensive lower quality lumber, or perhaps you might even pick up some left over boards for free from a construction site. I used 1 x 6 boards for my 2 foot by 2 foot portable box with a 1/2 inch plywood bottom, and 2 x 12 boards for my 4 foot by 12 foot box. This box has no bottom. If you intend to have a number of SFG boxes, make sure and budget enough time to make all of your boxes in advance. The second ingredient for building a square foot garden is the soil. Mel’s Mix is perfect for the job, and is made up of 1/3 vermiculite, 1/3 peat moss, and 1/3 compost, all available at most garden supply stores. It can cost over $100 to fill a six inch tall 4’ x 4’ box with Mel's Mix. However, using Mel's Mix virtually guarantees a perfect soil for your garden right from the start. Once you have mixed together your Mel’s Mix ingredients, add it to your box a few inches at a time, wetting each layer well before putting in the next layer. This assures no dry pockets. Once you fill the box with Mel’s mix, you don’t ever have to add vermiculite or peat moss again. Just mix in a little compost each time you replant a square. 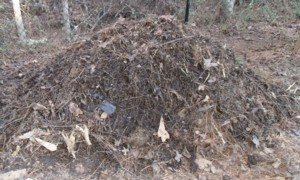 If you start building a compost pile when you start your garden and turn it often, your compost may be ready in time for the next plantings. Is there an alternative to Mel's Mix? If you don’t have enough money to fill your box with Mel’s Mix, DO NOT put in soil from your yard. This is just looking for problems. Do you know how well this soil will drain? Is the nutrient balance correct? Does it contain weed seed? 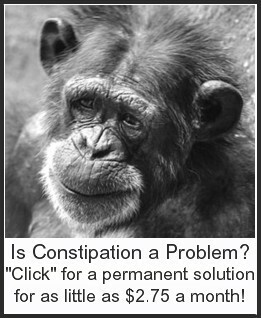 Does it have other disease problems? If you want the benefits of building a square foot garden, you will need to invest in good soil. Another option to filling your box with Mel’s Mix is to fill your box with compost. You will want to combine at least 4 sources of compost to have a well-rounded soil. Mushroom compost, which is composted chicken litter, and compost made from cow dung are commonly available at lawn and garden centers. Of course, you can make your own compost for free, if you have enough time to make some before gardening season. Though Mel says otherwise, neither Mel's mix or compost generally contain all the needed trace minerals. I always fertilize with liquid sea minerals to add these needed trace minerals. Another great way to great soil is to bring balance with a high quality soil conditioner that contains sea minerals. Is Square Foot Gardening For You? Is building a square foot garden right for you, or does it sound too expensive or difficult? It may be a good fit for you if any of these is true of you. Once you have decided to go for it and are done building a square foot garden, find a place in your yard or on your patio where it will get at least 6 to 8 hours of sunlight a day. Try and put it close enough to the house, since you will want to visit it at least daily to tend it, close enough where you will enjoy it more! 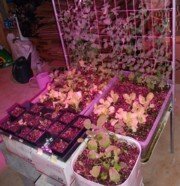 For some good tips on square foot gardening, click here. 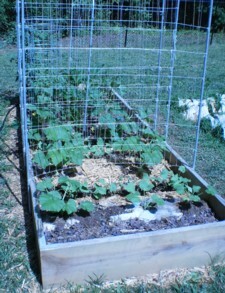 Click here to read insights from Wikipedia on square foot gardening. Enjoying highly nutritious vegetables from your very own garden is what healthy vegetable gardening is all about. Enjoy!